Does your closet look like a “black hole”? Is black the predominant color in your wardrobe? No worries, black is never out of season anymore! On my recent trip to the San Francisco Bay, one thing stood out most about the street style: Black was the new…black…err, let me rephrase that: it was definitely the color of choice among stylish women – even as temperatures reached the high 80s F (30-31ºC). A LBD or black hat might seem counter-intuitive – black retains heat. But any other color would definitely pale in comparison (pun intended). 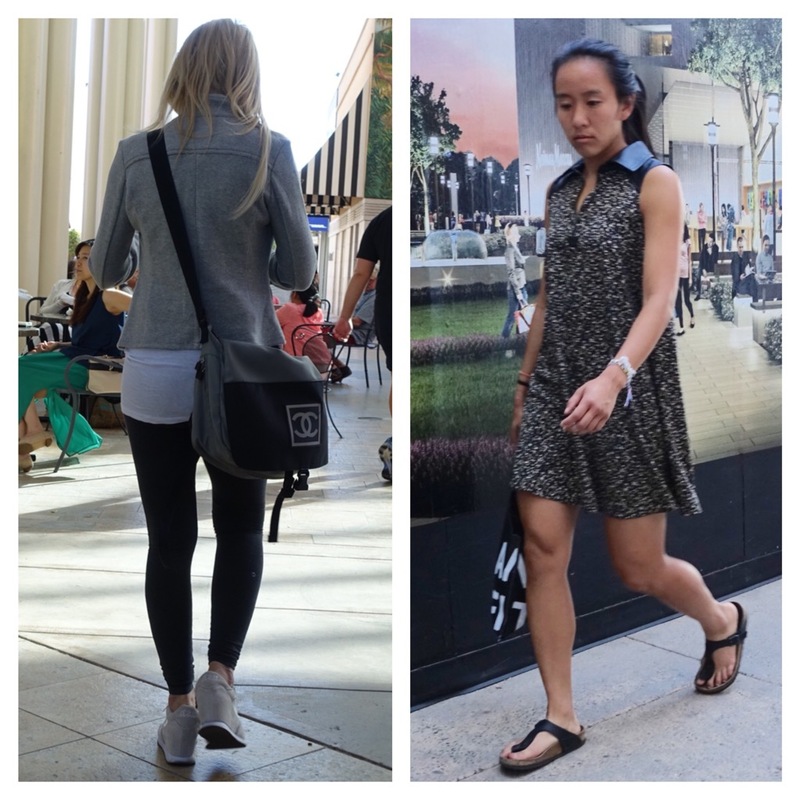 From Palo Alto to San Francisco (and up to Napa), it seems that many a woman is heeding recent style advice of bloggers and fashion magazines to wear black – in spite of bright, sunny days. And you have to admit, the look is chic. My favorite version includes accents in white, as seen with the handbag and belt on the muse pictured below. One typically coordinates a mini skirt like the one below with a matching hue: blue or ivory; however, a black tank makes for a refreshingly inspired ensemble, don’t you think? The contrast adds more interest and gives it an edgy, urban vibe. Grey and beige also work with summer black. While the unexpected seems to be one of the main charms of this black-in-summer trend, a leather collar in sultry weather (on the muse to the right) goes the extra mile to laugh in the face of practicality. It also brings an otherwise very casual look – complete with Birkenstocks – up quite a few style notches. Black leather at the end of our next muse’s sleeves is an especially surprising and delightful touch. So is the sporty white stripe along the side of her trousers, paired no less with high-heeled black pumps…as soon as she gets changed. My friend and theSTYLetti collaborator Julia has noticed while living in Italy, that women there combine casual and elegant clothing and do it with style. I tend to think of New York as demonstrating more European style than San Francisco, but by Giorgio!, I sense a bit of Italian spirit here. The most eye-catching of the Bay Area muses I spotted was, of course, this woman dressed primarily in black leather…in the sweltering heat. For all we know, she arrived on motorcycle, and with black hair pulled into a sleek ponytail, I would say she takes moto chic to new heights. There is nothing like black for adding a touch of elegance, edginess, formality, or simply style to your summer look. I hope you were inspired by these stylish Californians modeling black in summer. They prove that you can go on creating beautiful things in that “black hole” of a closet!